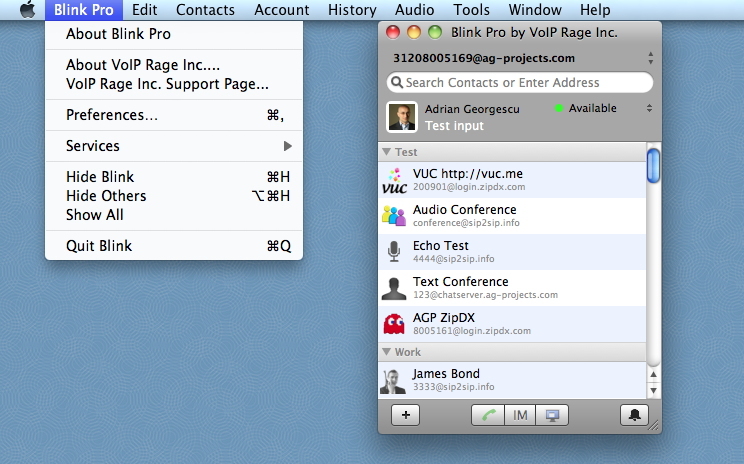 Blink can be featured with menus related to service provider name and settings. These include the SIP server settings page where additional services can be purchased directly from the service provider without having to login again on the web site. This product is designed for existing customers of AG Projects that have purchased Multimedia Service Platform or SIP Thor platforms. AG Projects is responsable for the development, support and distribution of the software. At a single click of a button, Blink can be downloaded and provisioned with a SIP account from the service provider. The end-user does not have to enter any account information, everything happens auto-magically. Blink can be provided with a license that allows for completely rebranding of a product derived from it. The application can be distributed as dmg installable image or from the Mac App Store. This version will work only with the designated servers of one SIP service provider. AG Projects is responsable for the development, support and distribution of the software. Blink can be provided to those interested with a non-GPL license that allows the forking of the project under a different name without the need to contribute back to AG Projects original project. The software is provided as source code tree that can be forked by the new owner for the purpose specified in the license. The customer is responsable for the development and distribution of the software. With the purchase of an additional support contract, AG Projects can deliver patches for bug fixes of existing versions as well as software updates. For inquiries about the above mentioned products and services please contact AG Projects.